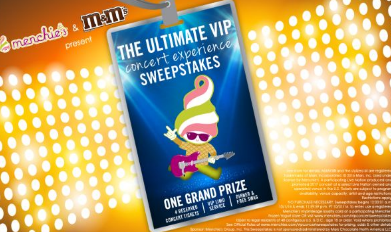 MENCHIES & M&M’S® Brand Sweepstakes – Win a $500 Restaurant.com gift card & more! Win 4 tickets to a select 2017 Live Nation concert and a $500 Restaurant.com gift card! ENTRY LIMIT – LIMIT: ONE (1) ENTRY PER EMAIL ADDRESS PER CALENDAR DAY. ELIGIBILITY – MENCHIES & M&M’S® Brand Sweepstakes is open to individual legal residents of the 48 contiguous United States and Washington, D.C. who are age 18 or older as of date of participation. SWEEPSTAKES ENTRY PERIOD – During each calendar day [(Pacific Time (“PT”)) beginning at 12:00:01 a.m. PT on October 1, 2016 and ending at 11:59:59 p.m. PT on October 31, 2016. PRIZES – One (1) Prize: Four (4) reserved tickets (the “Tickets”) to a select 2017 Live Nation produced and promoted concert at a participating Live Nation owned or operated venue in the United States (the “Venue”); ground transportation for winner and his/her three (3) guests to the Venue; and one $500 Restaurant.com gift card. (Prize Restrictions: Tickets are redeemable until December 31, 2017, or while supplies last. Selection of concert seat locations is solely within Live Nation’s discretion. Approximate Retail Value (ARV) of Grand Prize: $4,000. 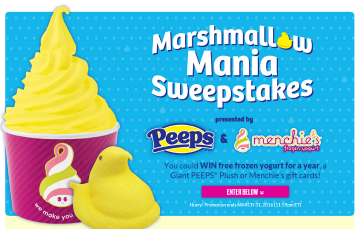 PEEPS® Marshmallow Mania Sweepstakes – Win a year of Menchie’s frozen yogurt! Win a year’s supply of Menchie’s frozen yogurt! ENTER SWEEPSTAKES HERE – PEEPS Sweepstakes page. ENTRY LIMIT – Limit one (1) entry per person/per email address. ELIGIBILITY – Open and offered only to legal residents of the fifty (50) United States and District of Columbia, who are thirteen (13) years of age and older at time of entry. SWEEPSTAKES ENTRY PERIOD – PEEPS® Marshmallow Mania Sweepstakes begins at 12:00:01 a.m. Eastern Time (“ET”) on March 1, 2016 and ends at 11:59:59 p.m. ET on March 31, 2016. 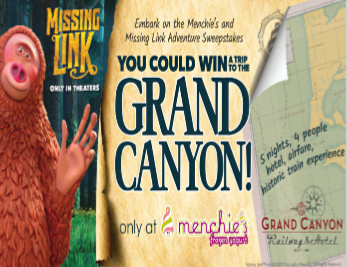 PRIZES – One (1) Grand Prize – A year’s supply of Menchie’s frozen yogurt (ARV $500). Three (3) First Prizes – A giant PEEPS® plush toy (ARV $100 each). Ten (10) Second Prizes – A $15 Menchie’s gift card (ARV $15 each).